Karen Technical Training Institute for the Deaf is a Public Tertiary Institution under the state Department of Science and Technology that started in 1990 to offer Technical Training to the Deaf Youth in Kenya. 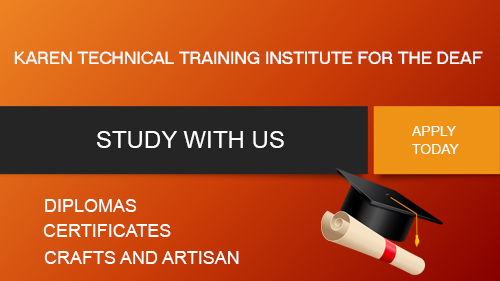 The Institute trains Students mainly at the level of Artisan, Craft and a few in Diploma courses; resulting from the minimal number of Deaf Youth who successfully complete the Kenya Certificate of Primary Education (KCPE) and the very few who even proceed to the Kenya Certificate of Secondary Education (KCSE) Level. Effective January 2015, the Institute moved the Department of Basic Education to the State Department of Science and technology, Directorate of TVET and assumed new status with a higher profile. These officers are responsible for the day-to-day Operations of the Institute. We dedicate ourselves to the provision of Technical and Vocational Education and Training using modern technology and innovation; guided by the values of commitment, hardwork, integrity and team work while upholding professionalism at all times. To be a centre of Excellence in Integrated Technical and Vocational Education and Training for the Hearing Challenged and the Hearing.